Gail was such a pleasure to work with! My husband and I both eat vegan, so we went on the hunt for the perfect vegan wedding cake. Bakies was the only one in Charleston that I found in my search and OMG it was soooo good. No one else at our wedding is vegan and everyone LOVED the cake. 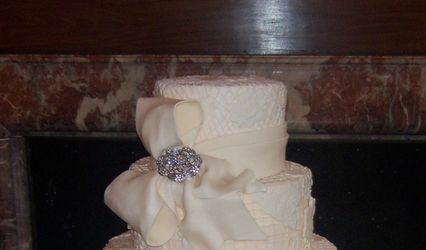 Also, it was absolutely beautiful and even though it was completely naked, no outer layer of frosting at all, it was super moist and even lasted through to the next day, when we finished it up before leaving for our honeymoon. Gail did a fantastic job and I would hire her again in a heartbeat. Look no farther you have found the best in Charleston! Bakies did a wonderful job not only with our wedding cake but also the specialty cookies they made for my bridal luncheon. They really took the vision I had in my head and brought it to life. Also, I am gluten free and they were able to make the whole cake gluten free and it tasted amazing! The guests didn't know that it was any different than normal wedding cake. I would highly recommend! Gail took my idea of a dream wedding cake and made it into something a million times better! It was a stunning cake. Believe it or not it all tasted better than it looked. I know, how was that possible? It was! She went out of her way to meet our deli very needs for the reception venue. 5 star service and 5 star product!! 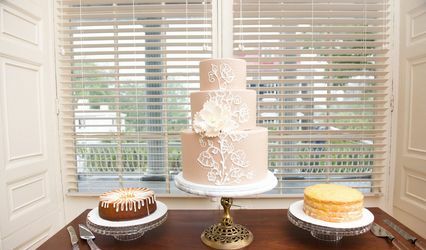 If i lived in the Charleston area I would use Bakies or all my cake needs! Thank you Gail for everything! !